If you're familiar with the Latin dish, Arroz con Pollo, consider this as the pork version. For this dish, pork is browned and then pressure cooked with rice and an aromatic mixture of broth and tomato sauce. Pat pork dry with paper towels and season with salt, pepper and garlic powder. Press SAUTE and add oil. When oil is hot, add half of pork and brown on all sides, 7 to 10 minutes; transfer to large bowl. Repeat with remaining tablespoon oil and remaining pork; transfer to bowl. Add onion to rendered fat and oil left in pot and continue to saute until softened. Stir in garlic, chipotle, thyme and oregano and continue to saute until fragrant. Stir in broth, tomato sauce and rice, scraping any browned bits from the bottom. Add browned pork with accumulated juice and bring to simmer. Press 12 and adjust the time to 5 minutes on HIGH pressure. When the IP beeps after pressure cooking for 5 minutes, allow your IP to naturally release pressure for 10 minutes. While naturally releasing pressure (also known as NPR or NR), the display will reflect numbers counting up from 1. The numbers indicate how many minutes the IP has stopped cooking since it beeped (or how many minutes it has been naturally releasing pressure). No need to touch your IP while it naturally releases pressure. When the display reflects L10:00 (which is 4 minutes since the IP has beeped), turn the setting on top of your IP to VENTING. Doing so allows the IP to quickly release any remaining pressure (also known as QPR or QR). I use a wooden spoon to carefully turn the setting to avoid close contact with the potential steam. You may also want to turn your IP away from cabinets to allow the released steam to escape freely. The pin at the top of your IP will drop when all pressure has been released and it's safe to open. Uncover and check a grain of rice: It should be nearly cooked through. - If the rice is just about ready, stir in cilantro and lime juice; season with salt and pepper to taste. Cover and let stand for 5 to 10 minutes longer to complete the cooking. - If the rice seems far from done, continue pressure cooking for 5 minutes or so, retest or turn off. Stir in cilantro and lime juice; season with salt and pepper to taste. Cover and let stand for 5 to 10 minutes longer to complete the cooking. 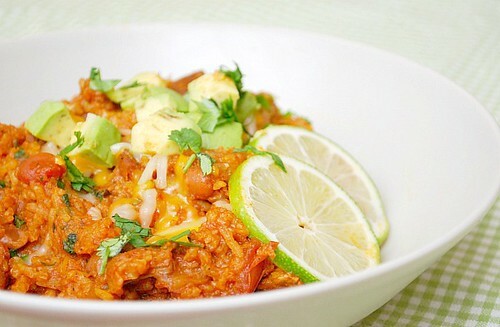 To serve, garnish with more cilantro, a sprinkling of cheese, lime and some freshly chopped avocado if desired.